Single mom Nina Donovan and her son Tom are blessed -- or cursed -- to have the seven larger than life Templetons next door, dressing up in period costumes and showing tourists their renovated stately, supposedly inherited mansion, in the Victorian (as in the Australian state of Victoria) gold rush country. Templeton Hall is near Castlemaine, north of the capital Melbourne and is the talk of the town, with locals wondering what attracted the English Templeton clan, Henry, his wife Eleanor, her sister Hope Endersley and their children Charlotte, Audrey, Gracie and Spencer, to this back of beyond area. If you look at a map of Australia, Victoria is the southernmost state -- aside from the island state of Tasmania directly below it. It's on the right hand side of the map, directly below New South Wales and to the east of South Australia. I'm recommending "At Home with the Templetons" as a book club choice, especially because it comes with a Random House Readers Circle guide. It's also good summer beach or mountain vacation reading. Standing out among the many themes in the novel is the Romeo and Juliet story of Tom Donovan and Gracie Templeton, from 1993 when they first meet to 2009 when they reunite. After the death of her husband, Nina moved to the Castlemaine area of Victoria from her home in the tropical state of Queensland (think Florida). She's renting a small farmhouse next to Templeton Hall, earning a modest living as a commercial artist. Tom and Gracie came across to me as the most sympathetic characters in the novel. Tom's mother, the young widow Nina, hasn't gotten over the accidental death of her husband and clings to Tom, who enjoys the companionship of kids his age, first Spencer and then Gracie. Tom develops into a fine cricket player, a bowler (like a pitcher in baseball) and the Templetons join with Nina in taking pride in his achievements. The novel spans the globe over more than two decades, with Charlotte ending up running a nanny school in Chicago, where there is a huge demand for nannies with English accents, and living in a fine house in the exurb of Woodstock, Illinois, which McInerney correctly states was where the Bill Murray film "Groundhog Day" was filmed. Audrey, after an initial stage fright incident at a school play and years of therapy becomes a success in New Zealand television, with her therapist turned husband. Spencer grows up to be ne'er do well and Gracie can't seem to hold a job longer than a few months. After leaving Australia, they both live in London, not far from their parents Henry and Eleanor. Spencer bonds best with his aunt Hope and both try to turn their addictions into profitmaking enterprises, with varying degrees of success, but with plenty of hilarity for the reader. Henry and Eleanor have spats and eventually split up, with Eleanor turning her home-schooling skills into a business, while antiques expert Henry expands into marketing collectible English cars for the American market. M: If you're ever in a jam, here I am/ F: If you ever need a pal, I'm your gal/ M: If you ever feel so happy you land in jail; I'm your bail/ D: It's friendship, friendship/ Just a perfect blendship/ When other friendships have been forgot/ Ours will still be hot. Ultimately, "At Home with the Templetons" is about friendship in all its forms. 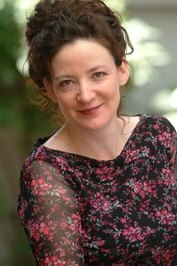 Monica McInerney is the internationally bestselling author of seven novels including Upside Down Inside Out, Family Baggage, The Alphabet Sisters and The Faraday Girls. She grew up in a family of seven children in the Clare Valley wine region of South Australia, where her father was the railway stationmaster and her mother worked in the local library. Before becoming a full-time writer she worked in children’s television, tourism festivals, book publishing, arts marketing, the music industry and as a waitress, a hotel cleaner, a Kindergym instructor and a temp. For the past eighteen years she and her Irish husband have been moving back and forth between Australia and Ireland. They currently live in Dublin.